Posted 1909. 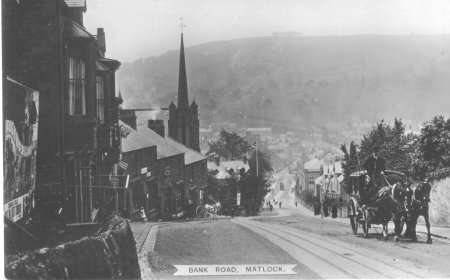 Looking up Bank road. 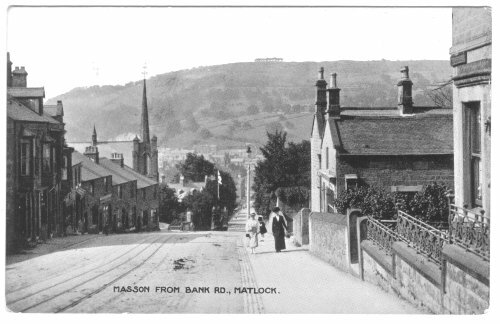 From a "Real photo" postcard, printed about 1910, showing Masson in the distance. 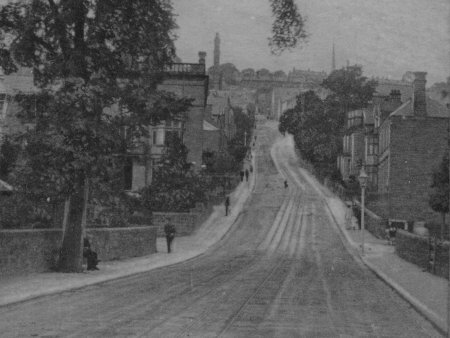 Bank Road still has its tramlines, the road is 1 in 6, making it one of the steepest tramlines in the World (the tram was pulled uphill by a buried cable under the road). 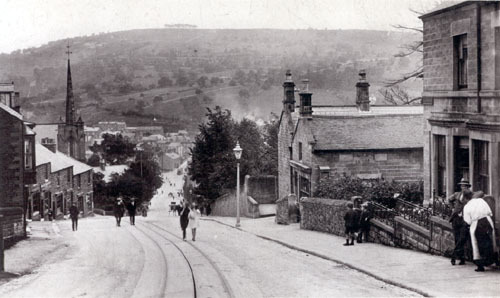 The author's family lived in the house on the left, William Doxey helped design the tramway and he was Clerk of the Works at Smedley's Hydro which is behind the photographer. 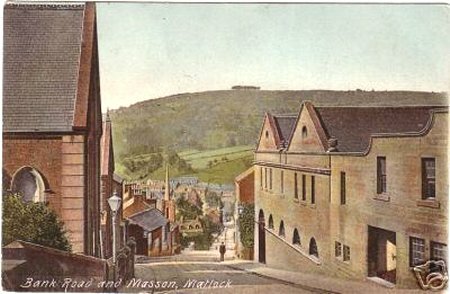 The spire is Matlock Weslyan chapel. 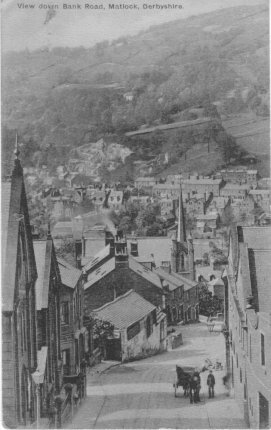 The chapel was opened in 1882, but the spire was not added until 1904. 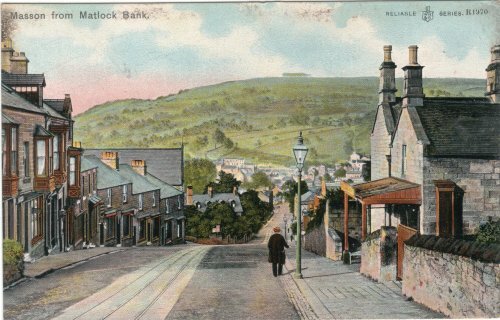 In 1886 Bank Road was still known as Dob Lane by older people, for whom the steepness was 'the Devil'. The author's GGGrandmother (aged 80) wrote as follows: "Charlie Champole? is dead, he was ruptured in his bowels some years. He went to Derby for a truss, when he came back he could hardly get up Dob Lane. They had to call up [Dr Hunter] in the night, he told him there was no hope except he would undergo an operation. He said he would, they gave him cloreform ,(I can not spell it right), and cut and took his bowels out, and put them right and sewed them up again, but he died with the chloriform (sic). " Unposted, taken c1905. A real photo PC, so plenty of detail when enlarged. The spire was built in 1904. Large cinema billboard on left reads "...Rough Riders of the World". A silent film based on Bufffalo Bill's show, called "Introduction to Rough Riders of the World" was first screened in 1903. 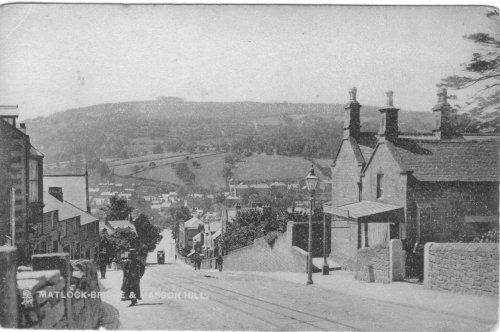 A two-horse coach with uniformed driver climbs the 1 in 6 Bank Road, it seems empty and may have just delivered a customer to the railway station from Smedley's or Rockside Hydro. Other interesting details: sign's reading "Singer Sewing Machines" and "Mortimers Cleaners". Also, 2 steep-gradient trams in the distance and 2 Union Jacks flying, and a horse and trap waits just down the road. Not posted. Message on the back reads: "This is the Primitive Chapel where I go every Sunday. House(?) below is the Wesleyans & next to that is our place so the Chapels are close to, this is Bank Road."